I am a roots woman, down on my hands and knees at the ground level of landscape and language, teasing apart the matted tangle of words that give rise to authentic action. Animated by a lifetime of reading and writing and by more than forty years of training in Zen meditation and organic gardening, I long for fresh kinship proclaimed in the dark green tongue of the land and to uncover the original mind of engaged practice by growing food for a hungry world. @ Davis Te Selle 2007. Hands in Dirt. 6”x9”. Pencil on vellum. 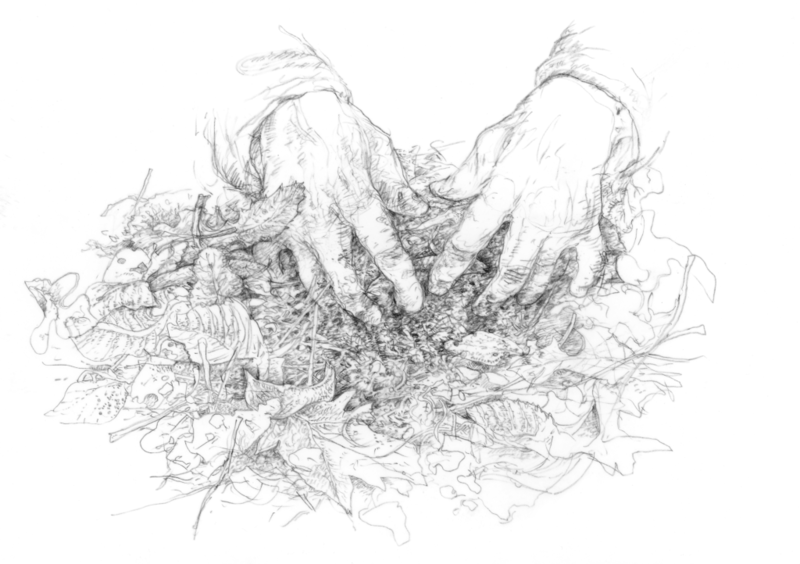 In this work, unearthing the roots of words is nourishment. Dharma and farm reveal ancient and radical affinity. The common root of these old words is dher, meaning “to uphold” and “to support.” Farm is etymologically linked to the Latin firmus, meaning strong and firm. A good farm is confirmed by upholding and supporting healthy crops and sharing real food with everyone who is hungry. In Buddhism the word dharma manifests as the Law, the truth, and the phenomenon and nature of Liberation teachings that uphold and support a dynamically interdependent universe. When Liberation teachings become grandiose and ungrounded, I return to the original roots of dharma in the way that the Buddha taught: ehipassiko, or come and see the body of truth for yourself. Sandiṭṭhiko: Apparent here and now. Good dharma teaching and maintenance of a working farm are not based on faith or belief but rather made visible in this world and enlivened through personal experience. Akāliko: Timeless, immediate. In the present moment the rewards of well-rooted dharma practice and engaged farming are both immediately available and harvested over the fullness of time. Opanayiko: Leading inwards. Just as the taste of ripe fruit can only be savored in the mouth, so must dharma practice and true knowledge of a farm be digested inside oneself and in the body of the living land. Paccattaṃ Veditabbo viññūhī: To be experienced individually by the wise. Dharma, or knowledge of a farm system, cannot be bestowed upon someone. Such knowledge must be perceived and known directly. When I ponder these ancient teachings and how to apply dharma practice to farming or how to infuse farming with dharma, I drop down to the root zone of authentic teaching, hungry for fresh alliance that is timeless and immediate. Drawing on the strength of farming and dharma roots, in 2009 I shifted the direction of my work and practice. Without formal mention of the buddhadharma, I began to teach at a local community college, helping to establish the Indian Valley Organic Farm and Garden, an innovative partnership program in sustainable organic agriculture and traditional ecological knowledge based on land that had historically been tended by the local Native American community for thousands of years. Now in our sixth growing season, this dynamic farming partnership is producing a steady harvest of affordable and nutritional food while offering access to productive farmland for intertribal Native and non-native farmers. Since its inception, more than eight hundred students have participated in this hands-on farming program. Two years ago my practice at Indian Valley deepened and widened when I began to teach with Melissa Nelson, one of our partners and a close friend and colleague who has served for two decades as executive director of the Cultural Conservancy, a Native-led nonprofit dedicated to protecting and restoring indigenous cultures. Melissa is a member of the Turtle Mountain Chippewa tribe and a writer, cultural and environmental activist, and professor of American Indian studies. Although our training and practice is different, we share a common commitment to meet the challenges of hunger by establishing a Native foodways program at Indian Valley and by following the basic tenets of organic farming. In May of this season we closed the academic year with a traditional planting ceremony and celebration of the Three Sisters crop trio of corn, beans and squash. We were joined by David and Wendy Bray, Cornell University trained and traditional Haudenosaunee knowledge holders from the Seneca Nation in western New York. The Brays’ twenty-eight-year-old daughter, Kaylena, works with Melissa at the Cultural Conservancy. More than seventy-five of us gathered that day under the shelter of a huge coast live oak tree at the edge of the farm. There the Brays told the Haudenosaunee creation story, making special reference to the Three Sisters—jöhehgöh, “our life sustenance.” With their guidance we were upheld and supported by Iroquois white corn, purple and black patterned bear beans and blue Hubbard squash, a gift from the Taos Pueblo in northern New Mexico. After their teaching the Brays led us out to open farmland at Indian Valley to plant the Three Sisters. We fanned out across the field in ceremonial silence and dug traditional mound beds for the seed of Onëo, Iroquois white corn that has been grown traditionally by three generations of the Bray family. Following the planting, we returned to the oak tree to share a sumptuous feast offered by Wendy Bray and other Native American friends. We ate white corn prepared in five delicious ways: as a traditional roast corn soup and as hull corn soup mixed with moose meat from western New York, as corn meal mush, as flat slabs of white cornbread and as corn dumplings doused with maple syrup from the northeastern forest. The farm contributed bowls of native beans and a fresh green salad. We closed the feast with a sample of the first strawberries from the field. Although the celebration officially ended at 2:00 p.m., most guests stayed until dusk telling stories, offering songs and snacking under the vast canopy of the coast live oak. Now, in October, the traditional white corn is ready for harvest, standing close to ten feet tall, speaking in the dry tongue of the ancient Iroquois Confederacy. Autumn wind sweeps the world. Bear beans that we sowed two weeks after the white corn germinated now climb their cornstalk scaffold festooned with vermilion flowers and ripening seed. At ground level Taos Hubbard vines cover dry earth, offering silver-blue squash with rich orange flesh all winter long. In my blood family of origin I am the eldest of three sisters. I remember this kinship as I enter Indian Valley at the sundown of the year to sit at the roots of corn, beans and squash. Here on the rim of darkness these three crop sisters of antiquity are visible in this world, able and ready to be examined and perceived directly. Their dharma roots are timeless and immediate, upholding and sustaining the radical vow to nourish a hungry world. May all beings in the ten directions come to the table and be fed. Wendy Johnson, author of Gardening at the Dragon’s Gate (Bantam, 2008), is a lay-ordained dharma teacher in the tradition of Zen master Thich Nhat Hanh and the San Francisco Zen Center. She is one of the founders of the organic farm and garden program at Green Gulch Farm Zen Center and a founder and instructor of “edible schoolyard” programs. Visit www.gardeningatthedragonsgate.com. Johnson was guest editor for Inquiring Mind's Fall 2014 issue, "Hunger," and Fall 2009's "Transformation."